In last week’s Famitsu, Namco Bandai teased a new game announcement. 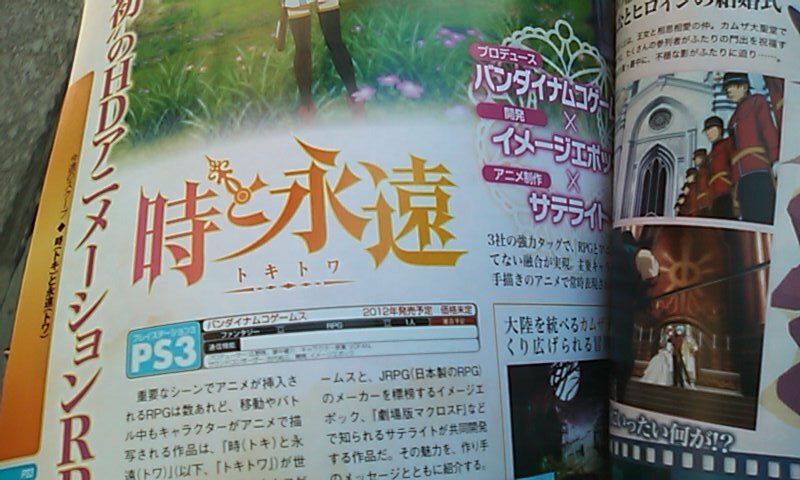 This week, the magazine revealed Toki to Towa, or Time and Eternity – a new RPG for PlayStation 3. It’s developed by Imageepoch – the studio responsible for Black Rock Shooter and 7th Dragon 2020 – with animation provided by Satelight – who are behind the TV anime Macross Frontier – and character design by Taiwanese illustrator Vofan. Yuzo Koshiro, known for his work on the Ys and Dragon Slayer series, is composing the game’s score. The high-definition quality anime in the game is moving, according to Imageepoch. The game will keep a consistent anime-style throughout, rather than simply shift during event scenes. It’s an HD 2D animation RPG, which uses animated sprites for characters and monsters, and 3D cel-shaded backdrops. There is a wedding scene between the player character (whose name you decide) (voiced by Tsubasa Yonaga / Jude Mathis in Tales of Xillia) and the heroine Toki (voiced by Kana Hanazawa / Mayuri Shīna in Steins;Gate), who’ve never before kissed. That’s about as far as story details go, so far (or as far as they’ve leaked, rather). Toki to Towa is currently 45 percent complete. Before it began development, it was in the planning stage for two years. It’s slated for release in Japan sometime this year. Thanks, Sinobi, My Game News Flash. Note: this article originally reported the game as featuring third-person shooting and strategy elements. 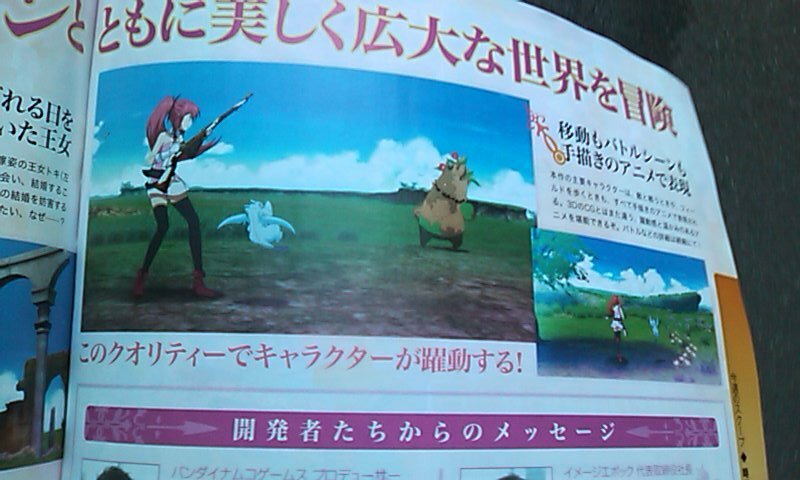 This information first appeared in a 2ch thread, though it may or may not be in Famitsu’s reveal story. Stay tuned for additional details.